This classic camera by Polaroid is a winner! The rumors of apocalypse were greatly exaggerated, it seems! Is your home now cramped with survival gear and supplies? Even if it isn’t, what better time than the present to get rid of some of your old stuff? Auction Bay can help you do precisely that, both clearing out space and simplifying your living, while making you money as well! You may have hidden treasures in your home, like this vintage-1970s camera! 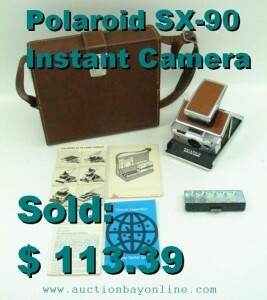 The Polaroid SX-90 camera is a sought-after item, and brings bids! This model was in good shape, with its original booklets and case, and sold for $113.39! Do you have items that could be worth a bundle on eBay? You never know unless you try! 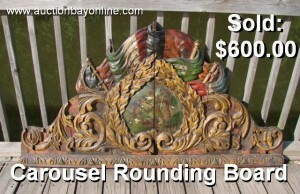 Classic Americana like this Carousel Rounding Board can bring impressive sales! 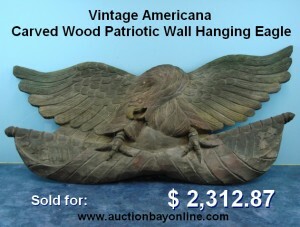 This fine example of carved Americana brought a great sale! Vintage Americana is one category with potential for huge sales. 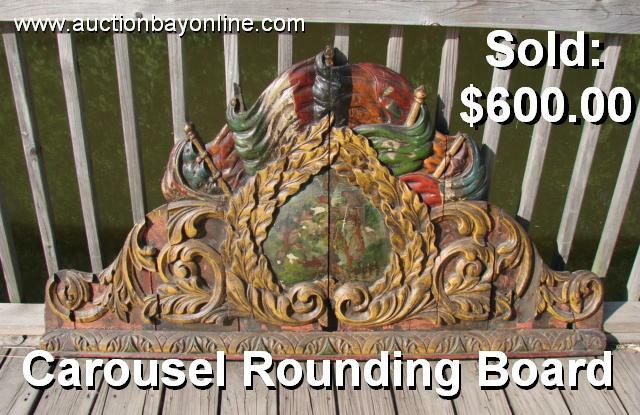 Just take for example this classic Carousel Rounding Board, elaborately carved of wood and featuring fine detail and bright colors! Pieces like this can bring in big bucks for collectors and restoration specialists, and it’s easy to see why! This piece was in great condition for its age, but needed some care and restoration. Its sale at $600.00 shows the potential for this genre, as great Carousel and Carnival items can be huge sellers. The detail of the carvings, the bright colors, and the size (roughly 60″ by 30″) all lent toward a strong sale. Auction Bay showcased its features, and the buyer did the rest. If you have classic American carved art like this, it could bring in the bids on eBay, and Auction Bay Online will help you sell it! This Mountee sold for big money! Sell your Bar Decor with Auction Bay! This vintage chalkware figure brought BIG bids! Auction Bay is the place to take your old advertising items, especially Bar Decor and Beer Signs! We’ll help you turn them into cash, just like we did with this figurine! This item is in impressive condition, and makes a fine collectable piece of Breweriana. 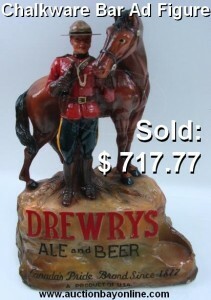 Advertising Drewrys Ale and Beer and standing over 16″ tall, this figure is made from chalkware, making it even more desirable (as it is hard to find a chalk figurine in such great shape)! It features the iconic mountee, proudly standing aside his horse. It brought 18 bids – a competitive auction for certain – and sold for $717.77! Genuine articles of vintage bar decor are sought after by fans of the beer as well as advertising collectors, not to mention bartenders. Sometimes, the biggest sellers in breweriana are from Beers which no longer are produced, or have changed their mascot or logo. Whatever your collectible is, Auction Bay can help you bring a strong sale! Your old toys are worth money! 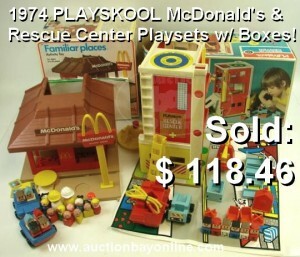 Vintage Playskool & Fisher Price can sell! These old toys sold for over $100! What's in your closet? Classic toys in good condition are one of eBay’s hottest kinds of items! Take, for example, this pair of vintage Playskool playsets! In good used condition, and with their original boxes, these toys brought great interest, gathering 11 bids, and selling for $118.46! For collectors, hobbyists, and nostalgic adults reminiscing upon their childhood favorites, old toys are often highly sought-after. Especially for popular brand names like Playskool, Fisher Price, LEGO, and Mattel, and also for obscure or rare names, the worldwide marketplace of eBay is your best bet for finding, buying, or selling old toys! And at Auction Bay, we are happy to help you get the biggest bang for your buck! If only, back when we were kids, we knew just how much more valuable our toys might be one day if we had only kept the box! For those with toys in good condition or near complete, eBay offers a great and profitable experience! This HO Scale model locomotive brought solid bids! Auction Bay will help you sell your model trains! Athearn once again delivers a big sale with the Genesis line of premium model trains! This HO scale model of a Santa Fe F45 Locomotive brought seven bids for a sale of $103.61! With high quality models like this, a complete presentation is key for high sales. When you show that the box and paperwork are intact, along with every tiny guardrail and ladder rung on the model itself, then the bidders know they will get the model they want, ready to run on their layout! 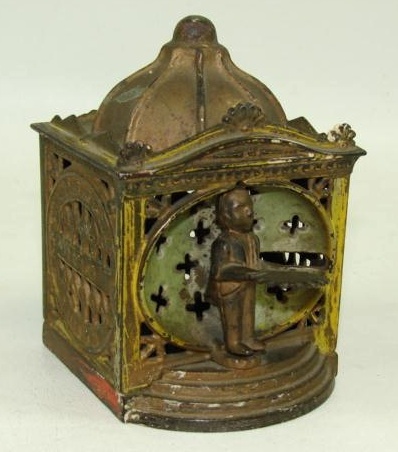 An antique Mechanical Bank – the HALL’S LILIPUT Brought in a huge sale! Don't let its small size fool you! This bank could be a huge sale! We were excited to watch this great item sell this week. This antique bank offered us an opportunity to watch the bidding process unfold for a rare and collectible item. This is the HALL’S LILIPUT BANK - an antique Cast Iron Mechanical Bank, with patent dates from 1875 and 1876! It retains little of its original paint, but is still in great working condition, with a surprising amount of detail in the cast body of the bank. After only two days running, it had 8 bids from 6 different bidders, at just a fraction of its potential worth. By the time the dust had cleared from the bidding war it saw, this bank had 20 bids for a total sale of $375.71! There are lots of collectible banks out there, and each has a chance to be worth a bundle! Whether yours is a still bank or a mechanical bank, with original paint or in need of restoration, Auction Bay can sell it for you! Antique Americana at Auction Bay! This carved Eagle brought huge bids! This piece of Americana sold for a huge $2,312.87 at Auction Bay! Here we have a piece of American history! We knew this fine specimen of antique Americana would bring a good sale, but we were surprised to see how high the bids went! This is definitely an Auction Bay favorite. 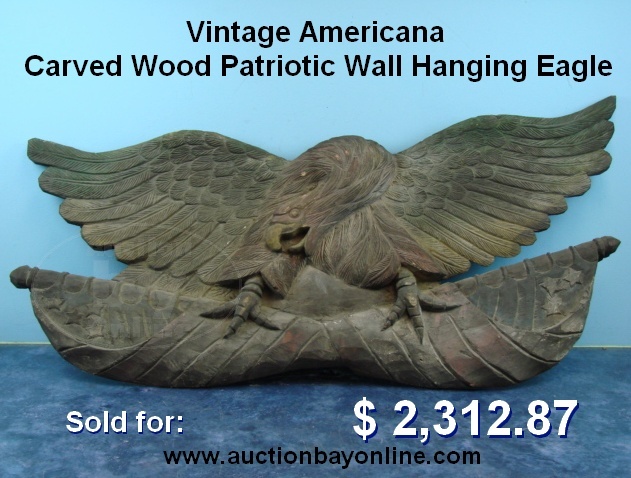 This vintage piece of patriotic decor was impressive in size, measuring 41″ wide by 18″ tall. It depicted a majestic bald eagle, the United States’ national symbol, with wings spread wide. Cut from a single piece of wood, it had impressive detail, from the lines in the feathers to the folds of the furling flags below. It attracted quite a few watchers, and 13 bids from 5 different bidders, all vying for the chance to add this bird to their collection. Its final sale reached a whopping $2,312.87!! If you know of any artworks like this one, or other specimens of America’s patriotism in art, they could be very valuable. We’d love to help you sell them, and our listing methods will make sure they get viewed by all the right people to sell for as much as the market will bear! This huge toy M5 Stuart Tank rolled into a huge sale! This huge toy model of the M5 Stuart tank brought a $154.00 sale! We love toys at Auction Bay. Toys can be really big sellers, partly because there’s always someone looking for that cool toy they always wanted from their childhood, or that one piece to complete their collection, or Birthday & Christmas presents for their children! And whatever toy you’re looking for, the place to find it is on eBay! This Tank is one of the coolest toys we’ve encountered! We’ve seen a number of great models and even some highly detailed replicas, but you’ve got to admit… nothing screams “cool toy” like a huge toy tank over 2 feet long! This 1:6 scale model replicates the M5 Stuart Light Tank used by American and British armed forces in World War Two. Made by 21st Century Toys roughly 10 years ago, this piece has maintained an impressive value on the collector’s market, and is popular among radio-control toy enthusiasts as well! After all, racing fast RC cars can be fun, but invading scale cities sounds pretty fun, too! In any case, this tank brought enough bids to score a $154.00 sale, in spite of the fact that it was a costly item to ship! Whether you have great toys like this one, or other WWII collectibles, we at Auction Bay will be happy to help you sell them! We make sure your items have the best chance of a top dollar sale! Hanna-Barbera Cartoon Character TinyKins bring in big bidders! These Hanna-Barbera Tinykins figures sold for $179.50! A lot has gone on at Auction Bay Online since our last post! Let’s share some success stories and get you caught up! Here’s an auction lot which brought a pleasant surprise! Here we have a lot of TinyKins figures made by Marx Toys, each depicting a classic Hanna-Barbera cartoon character! These plastic figurines range in height up to 2″ tall, and were sold as a set of 34! All your favorite characters are here, including cartoon cast members from The Flintstones, Yogi Bear, Top Cat, Quick-Draw McGraw, and Huckleberry Hound! We started this lot out at our standard start price of $24.99, and it brought 11 bids to a handsome closing price of $179.50! Pretty impressive for a bunch of tiny toys from decades past! The Omnibot 2000 toy robot serves up an entertaining auction! This Omnibot 2000 sold for $295.00 at Auction Bay! Here’s another great old toy robot sold at Auction Bay! This one brought quite a bidding war! This Omnibot 2000 was one of the best robotic toys of the 1980s, made by TOMY. Still in its original box, this piece had been well kept by our consignor for over 20 years, and just sold on eBay for an impressive $295.00! There are many toy robots out there, and you never know which one might be a great collectible like this one. Bring yours into Auction Bay and get your free item assessment, and you might be pleasantly surprised!